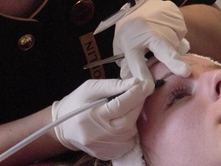 Taking the utmost care in electrolysis treatments, we use gloves, sterilized equipment, and topical anesthetic. A European-licensed electrologist with more than 35 years experience will perform your treatment. The service prices are subject to change, so please refer to our current price list that is available in the salon.